Last February, I visited our dear Ecole Fula Flute / Centre Tyabala in Conakry, Guinea and I am happy to report that things are going well. I was expecting difficult conditions, but thanks to your donations and the hard work of our associates on the ground, we have moved into a decent four-bedroom house with a large walled-in courtyard. I found it cleaned up, painted, completely functional with electricity, bathroom (though no running water), a performance stage built and, by now, a corrugated metal roof installed over most of the courtyard. I was impressed and encouraged to see this magnificent work. The house sits at the end of a long driveway behind a gate, secluded from the main road, but not isolated, a few minutes’ walk from where we were before making it easy for the kids to get to school and back. I teached every day, refreshing their knowledge of music theory and made progress with the chromatic flute. We recorded the student’s repertoire and performed a concert for the community. Before, when we were in the large public space at Maison des Jeunes, we were subjected to many disruptions and distractions, now that we control our environment we can really concentrate. We built many standardized flutes to improve the tuning and to spare the traditional flutes for performances, we also tuned the ngonis (traditional guitar) with them with the happy result that you can hear in the video clip above. Our faculty includes Master flutist Mamady Mansare, who enthusiastically supports this initiative and is very happy to participate in the emergence of a new generation of flutists. 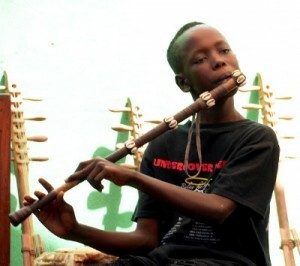 Master Bouba Mbeng is a dedicated teacher of voice, ngoni and percussion. We all benefit from his calm and assiduous presence. You can see him at work in the video below. Co-founder Véronique Lamah, directs and performs plays with the students that are often presented around town. She is also our mom and supervises daily operations. Our Director and co-founder, Momo Sylla knows everybody and everybody knows him, he is a man of the theater with a deep commitment to his mission and is always striving to render meaningful the Centre’s place in the community. Other faculty are providing classes in French, arithmetic, social sciences, dance and, possibly soon, music theory. We have been working on tightening operations and adding more classes in elementary subjects. Therefore, we are in a good place, definitely an incredible improvement from last years’ conditions, and are optimistically pressing forward. Our main challenges are to continue finding support and transition from an informal program into a viable institution. Our evolution has been organic, rooted in the realities of Guinea and as we grow, are uncovering our identity. This project has inspired many people to contribute and that is an integral part of our success. We are the seed, Guinea is the soil, and You are the water. ​We are most grateful for anything and everything you do.